The Master of Ballydoyle lifts the lid on his star-studded stable of Classic contenders and top older horses in an exclusive tour with attheraces.com. Aidan O’Brien is simply a phenomenon in the world of racing. A record-breaking National Hunt trainer in the initial stages of his career, his abundant talents didn’t go unnoticed and he was appointed as the trainer in the historic Ballydoyle complex in 1996 at the age of just 26. As always, O’Brien has an array of stars under his care for the new season headlined by a strong team of older horses including Minding, Alice Springs, Order Of St George plus new recruit Acapulco. Even more promising is his team of three-year-olds, with Churchill, Caravaggio and Rhododendron being just three of his potential Classic winners. Aidan was good enough to sit down with Kevin Blake to discuss their prospects for the 2017 season. Rated 107, she won the Queen Mary Stakes at Royal Ascot and finished second in the Nunthorpe Stakes at York as a juvenile. She won a Listed race at Churchill Downs last year for Wesley Ward and transferred to Aidan O’Brien during the winter. Rated 118, she won the Falmouth Stakes at Newmarket, the Matron Stakes at Leopardstown and the Sun Chariot Stakes a Newmarket last year. She made a promising return to action when second in the Gladness Stakes at Naas in April. Rated 116, she won the Albany Stakes at Royal Ascot prior to sending much-improved form to win the Cheveley Park Stakes at Newmarket in September. Rated 113, he won three of his five starts as a juvenile including the Beresford Stakes at the Curragh. He finished fourth in the Ballysax Stakes at Leopardstown on his seasonal reappearance. Rated 116, he won all four of his starts as a juvenile including the Coventry Stakes at Royal Ascot and the Phoenix Stakes at the Curragh. Rated 122, he won five of his six starts as a juvenile including the National Stakes at the Curragh and the Dewhurst at Newmarket. Built on his encouraging debut when winning a seven-furlong maiden at Leopardstown by 5½ lengths from Orderofthegarter in October. Rated 110, he won a maiden at Leopardstown in July and acquitted himself well without winning in three subsequent starts in Group company, including when a close fourth in the Criterium de Saint-Cloud in October. He made a promising return to action when second in the Ballysax Stakes at Leopardstown. Rated 109, she won two Listed races over five furlongs for Michael Dods in 2016. She changed hands for 500,000gns in February. Rated 110, he is a half-brother to Blue Bunting and won a maiden at Galway in September prior to finishing a close third in the Beresford Stakes at the Curragh. Rated 101, he made it fourth-time lucky in a maiden at Navan in October prior to finishing seventh in the Racing Post Trophy at Doncaster. Rated 123, he won the King George VI and Queen Elizabeth Stakes at Ascot and the Breeders’ Cup Turf last season. He disappointed on his latest start in the Sheema Classic at Meydan in March. Rated 111, she won a conditions race at the Curragh and finished second in the Moyglare Stud Stakes at the Curragh and in the Fillies’ Mile at Newmarket as a juvenile. She made a winning seasonal reappearance in the 1,000 Guineas Trial Stakes at Leopardstown in April. Rated 119, he progressed into a high-class middle-distance performer last season, finishing second in the Irish Derby and winning the Great Voltigeur Stakes at York. Rated 117, he won a maiden at Leopardstown in August and went on to run very well when second in the Dewhurst at Newmarket and the Breeders’ Cup Juvenile Turf at Santa Anita. He made an encouraging return to action when fourth in the UAE Derby at Meydan in March. Rated 122, she was crowned European Champion Two-Year-Old Filly in 2015 and enjoyed a remarkable three-year-old campaign in which she won five Group 1 races including the 1000 Guineas, the Oaks and the Queen Elizabeth II Stakes at Ascot. Rated 120, he won the Irish St Leger in 2015 and the Ascot Gold Cup last year. He also finished third in last year’s renewal of the Prix de l’Arc de Triomphe. Rated 111, he finished second in both his starts in maidens last season, but has shown much-improved form this season in winning a maiden at Naas by 11 lengths and the Leopardstown 2,000 Guineas Trial Stakes by 3¾ lengths. Rated 113, he won a Listed race at Naas in May and the Anglesey Stakes at the Curragh in July prior to finishing a close third in the Prix Morny at Deauville. Rated 111, she won the Silver Flash Stakes at Leopardstown in July and went on to finish second in the Prix Marcel Boussac at Chantilly. She ran below form on her seasonal reappearance in the 1,000 Guineas Trial Stakes at Leopardstown in April. Rated 98, she made a winning debut in a seven-furlong maiden at Leopardstown on Irish Champions Weekend for David Wachman and made a satisfactory return in the 1,000 Guineas Trial Stakes at Leopardstown in April. Rated 116, she won three of her five starts as a juvenile including the Fillies’ Mile at Newmarket. Rated 115, she progressed into a high-class juvenile last season, winning the Cherry Hinton Stakes at Newmarket and finishing a short-head second in the Cheveley Park Stakes. Rated 119, she won the Irish Oaks and the Yorkshire Oaks last season and made an encouraging return to action when second in the Sheema Classic at Meydan in March. Built on his promising debut when winning a maiden at Gowran Park by seven lengths. Rated 114, she won the Cheshire Oaks at Chester and the Snow Fairy Fullies Stakes at the Curragh last year. She made an encouraging seasonal return in the Park Express Stakes at Naas in March. Rated 119, he won the Chester Vase last year prior to finishing second to Harzand in the Derby. He made a satisfactory return to action in the Alleged Stakes at Naas in April. Rated 113, he made a winning debut at Leopardstown in June and having finished second in the Superlative Stakes at Newmarket, he won the Vintage Stakes at Goodwood in fine style. Rated 108, he won a maiden at Naas in August and went on to finish in the frame in two Group races, most notably the Prix Jean-Luc Lagardere at Chantilly. Rated 106, she made it third-time lucky when winning a maiden at Dundalk in August when trained by David Wachman. She showed much-improved form on her seasonal reappearance when a close second in the 1,000 Guineas Trial Stakes at Leopardstown in April. Rated 111, he won a maiden at the Curragh prior to finishing second in the Beresford Stakes at the Curragh and in the Racing Post Trophy at Doncaster. He made an encouraging return when a close third in the Ballysax Stakes at Leopardstown. MINDING – A superstar filly that is likely to have another lucrative campaign. CHURCHILL – Winner of the National Stakes and Dewhurst, he is a top-class Classic prospect. CARAVAGGIO – Top-class juvenile that is a leading three-year-old prospect. CLIFFS OF MOHER – Very impressive maiden winner that could be anything. ACAPULCO – An American import that could be a top-class sprinter in the making. ALICE SPRINGS – Top-class filly on her day that should have a profitable four-year-old campaign. 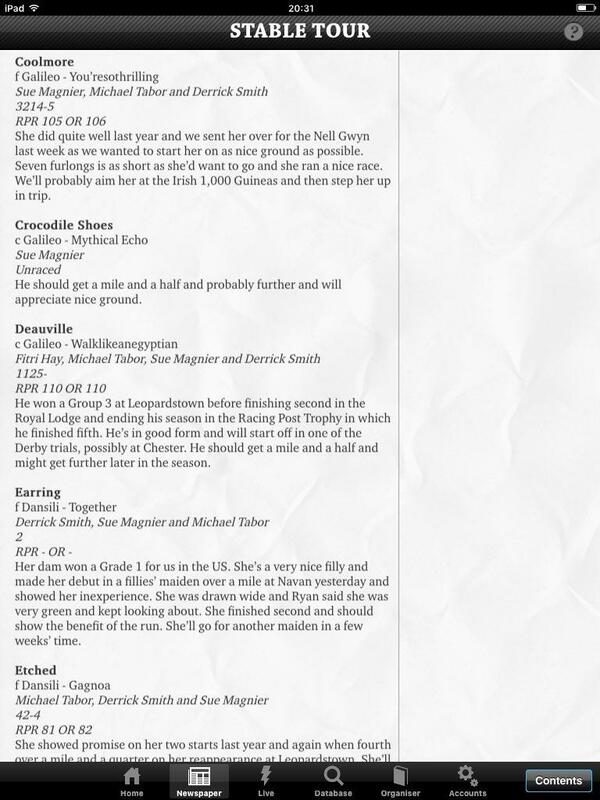 ORDER OF ST GEORGE – Top-class stayer that is being aimed at the Ascot Gold Cup. Aidan O’Brien is simply a phenomenon in the world of racing. A record-breaking National Hunt trainer in the initial stages of his career, his abundant talents didn’t go unnoticed and he was appointed as the trainer in the historic Ballydoyle complex in 1996 at the age of just 26. He quickly established himself as a dominant force in Irish racing and since then has broken every record worth breaking and won every race worth winning in Europe and beyond. As always, O’Brien has an array of stars under his care for the new season and he was good enough to sit down with attheraces.com to discuss their prospects for the 2016 season. Rated 124, he was crowned European Champion Two-Year-Old having become the first-ever horse to complete the Group 1 triple of the Phoenix Stakes, the National Stakes and the Dewhurst Stakes. He proved very disappointing on his seasonal reappearance in the 2000 Guineas at Newmarket. “I think anything I did for the 2000 Guineas, I won’t do again, as it was a dramatic failure, really! Everything was smooth all the way to Newmarket. He never disappointed in his work and the horse he was working with went on to finish fourth in the 2000 Guineas, but he didn’t perform on the day. We put on the tongue tie because in his second-last piece of work, I was just a bit shocked how quick he was and I thought he’d struggle to get the mile if he did that at Newmarket. Sometimes when you put a tongue tie and a crossed noseband on a horse, it can make them slow down and back off a little bit. It seemed to work well straight away in his canters at home, but it just didn’t work out at Newmarket. He might not always look like he is racing very freely as he has a very good head position when galloping, but if you watch closely, he was doing plenty. Some would say that if the trip was the issue, that he should have travelled better for longer than he did, but it’s not always like that, as the pace is so different over a mile than over six furlongs. When you are restricting a horse from going the sort of pace they naturally want to go, they often don’t get much further than four or five furlongs. It might sound strange, but if a horse like that was allowed go six-furlong pace from the start in a Guineas, they would probably be competitive for longer than they would if restrained early on. I remember with Stravinsky, he wasn’t even able to win over seven furlongs against three-year-olds as the tempo just wasn’t strong enough for him, but as soon as we dropped him back to six furlongs and then to five furlongs, he came into his own. With the tongue tie and crossed noseband, you’re making calls on things like this all the time and sometimes you can make very bad calls. I would always rather try something like that if I felt it would make the horse perform better and learn from what happens whether it works well or not and not be afraid to say it was the wrong call afterwards. So, we have left the tongue tie and crossed noseband off since Newmarket and I would imagine it will stay off for his next race too. Rated 112, he won a seven-furlong maiden at Gowran Park in June and went on to finish a close second to Birchwood in the Group 2 Superlative Stakes at Newmarket in July. He made a promising return to action when fourth in the 2000 Guineas at Newmarket. Rated 113, she progressed throughout her juvenile season to win the Group 2 Debutante Stakes at the Curragh and the Prix Marcel Boussac at Longchamp. She made a promising return to action when second in the 1000 Guineas at Newmarket. Rated 98, she won a maiden at the Curragh in October, but ran below form on her return to action in the Salsabil Stakes at Navan in April. Made an impressive winning debut in a mile-and-a-quarter maiden at Leopardstown in April. Rated 103, he won a maiden at the Curragh in October prior to finishing third in the Killavullan Stakes at Leopardstown. He made a winning return in a Listed race at Leopardstown. Rated 118, he proved to be highly-progressive last season, winning the Group 3 Curragh Cup and being unlucky not to win the Great Voltigeur at York and the St Leger at Doncaster. He made a winning return in a Listed race at Limerick. Made an impressive winning debut at Dundalk in April, beating the subsequent winner Lundy in good style. Rated 106, she broke her maiden in the Group 3 at the Curragh in September and made a satisfactory return to action in the Nell Gwyn Stakes at Newmarket in April. Rated 110, he progressed into a smart juvenile last season, winning the Group 3 Tyros Stakes at Leopardstown and finishing second to Foundation in the Group 2 Royal Lodge Stakes at Newmarket. An unraced full-brother to the great racemare Zenyatta. Rated 119, she won a Group 1 as a juvenile and gained a second top-level success when beating Golden Horn in the Breeders’ Cup Turf at Keeneland. She got off the mark for this season in the Mooresbridge Stakes at the Curragh in May. Rated 119, he won the Grade 1 Secretariat Stakes at Arlington in August and the Hong Kong Vase at Sha Tin in December. He disappointed on his latest start in the QEII Cup at Sha Tin in April. Rated 116, he was unbeaten in three starts as a juvenile, with the highlight being his win in the Breeders’ Cup Juvenile Turf at Keeneland in October. Rated 108, he won a maiden at Gowran Park in October and has run well without winning in the Ballysax Stakes and the Derrinstown Stud Derby Trial Stakes at Leopardstown this season. Rated 113, he progressed throughout the season, culminating in victory in the Group 1 Criterium International at Saint-Cloud in November. Rated 110, he is a two-time winner at Listed level that finished an unlucky second in the Ascot Gold Cup last season. Rated 120, she was crowned European Champion Two-Year-Old Filly last year having won the Moyglare Stud Stakes at the Curragh and the Fillies Mile at Newmarket and looked better than ever when making a winning return in the 1000 Guineas at Newmarket. Rated 124, his form was unremarkable as a juvenile, but he showed significant improvement when upped in trip last season, most notably when winning the Irish St Leger at the Curragh by 11 lengths. Rated 105, he won the Beresford Stakes at the Curragh last year and was beaten a short-head by US Army Ranger in the Chester Vase on his return to action. 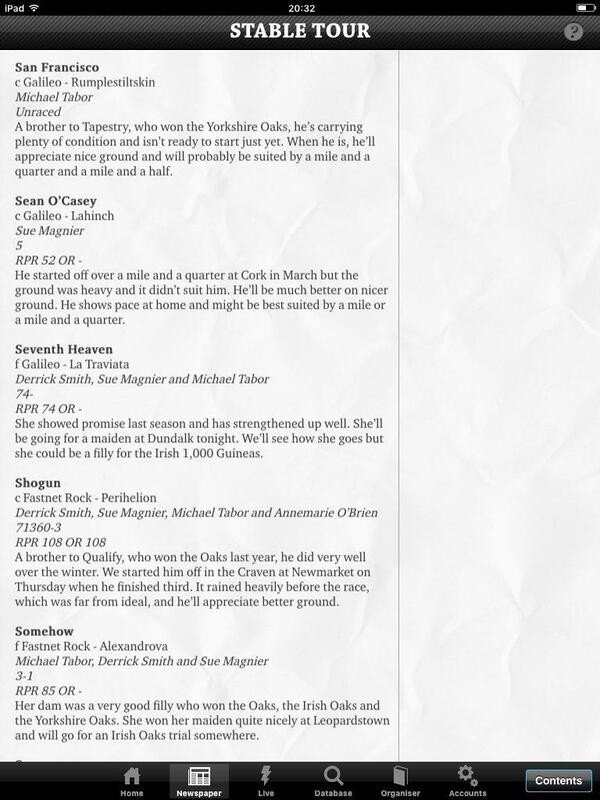 Rated 106, she won a maiden at Leopardstown in October and made an impressive return to action when winning the Salsabil Stakes at Navan in good style. Out of the top-class filly Misty For Me, she made a winning debut in a five-furlong maiden at Naas in April. Rated 93, she won a maiden at Dundalk in April and followed up in the Oaks Trial Fillies’ Stakes at Lingfield in May. Rated 108, he won a maiden at the Curragh in July and has run well without winning in Group company on multiple occasions since, most recently finishing second in the Derrinstown Stud Derby Trial Stakes at Leopardstown. Won a maiden at Leopardstown in April and followed up in a Listed race at Chester in May. Delivered on the promise of his debut when winning a maiden at Navan by nine lengths in April. Made a winning debut in a maiden at the Curragh in April and followed up with a narrow win in the Chester Vase in May. “Everyone is knocking the horse after Chester, but they shouldn’t be. There’s no doubt, I was a lot happier with him coming out of Chester than I was coming out of the Curragh. I remember Joseph saying to Ryan before he got up on him at the Curragh that this horse could be beaten here and still win the Derby. That’s how far behind he was where we wanted him to be. We knew going to Chester that it wasn’t going to be easy for him, but he had to go there and learn if he was going to have a chance of winning the Derby. He was unraced as a two-year-old, so he had to learn in one race what he would have learned in two or three races. He was still so raw, he didn’t change his legs at all in the straight. He was whinnying before the race and after he pulled up, he was whinnying again, he didn’t know what was after happening. What I liked the most about his performance was how well he travelled, as at no stage were they ever going quick enough for him. With hindsight, it would have been better for him if there was more pace in front of him, but he probably learned more the way the race panned out. Formerly trained by Gai Waterhouse in Australia where he won the Group 1 Golden Slipper at Rosehill. He joined O’Brien in January. Rated 112, he won the Windsor Castle Stakes at Royal Ascot prior to finishing second to Air Force Blue in the Phoenix Stakes at the Curragh. He made a winning return in a Listed race at Dundalk prior to disappointing in a Group 3 at Ascot in April. 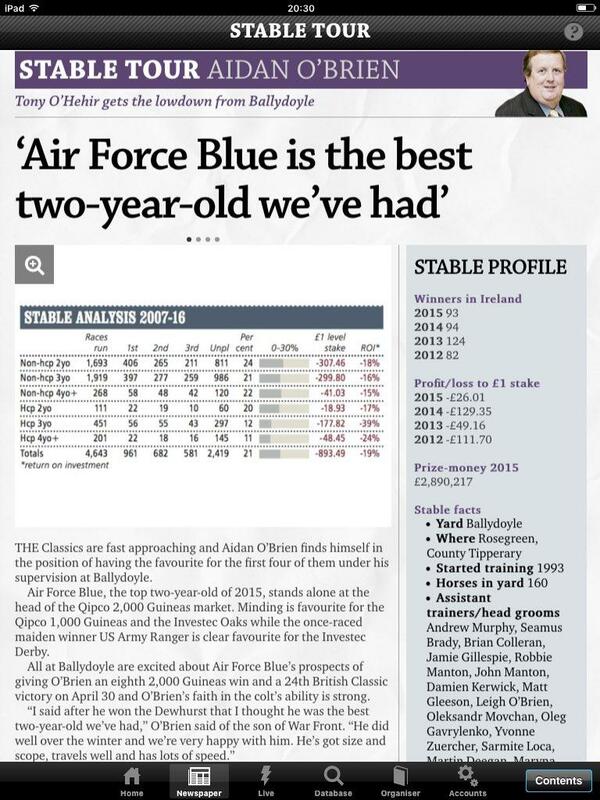 AIR FORCE BLUE – A star juvenile that will bid to bounce back in the Irish 2,000 Guineas. MINDING – A superstar filly that is hotly-fancied for the Oaks. 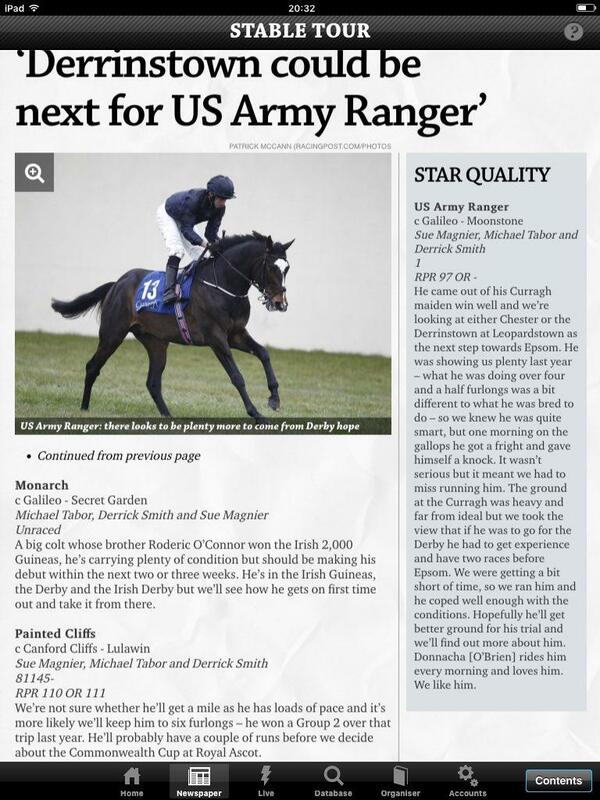 US ARMY RANGER – Unbeaten in two starts and a leading Derby hope. FOUND – One of the top older horses in training. 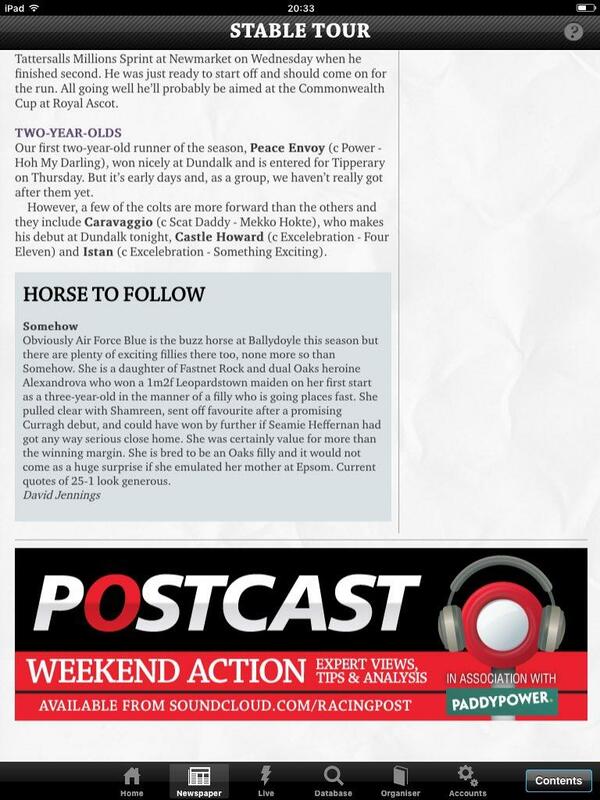 BALLYDOYLE – Top-class prospect that made an excellent return in the 1000 Guineas. VANCOUVER – An Australian import that could be a top-class sprinter in the making. AOBFS Stable Tour 2016 complete A Big thank you to Red Hrafan for proof reading and correcting my mistakes. I will add anymore Stable tours to this page that come along in the future. Thanks for reading hope it was somewhat helpful. Ended up doing a fully blown preview of the Juveniles could not stop when I started ha. First Season Sires - Coolmore's Big hopes for the champion first season sire title which they won with Zoffany in 2015 come in the form of Excelebration & Power They also have Requinto but as yet has no 2 year olds at Ballydoyle. Excelebration so far has 3 Ballydoyle Juvenile colts Istan a 150,000 purchase & Castle Howard a 220,000 Purchase & an unamed colt out of Lady Miletrain who was a 450,000 purchase and could be the best of the Excelebration's. Power will be represented by 4 Juvenies so far they are Soa Paulo a 150,000 Euro purchase heard good reports on him he should be a nice early type Pronounced a 70,000 EURO Purchase and a unamed colt out of Hoh My Darling who was a 125,000 Euro purchase and 2YO Filly Poppit a 180,000 GNS purchase. Second Season Sires - Champion first season sire Zoffany to date will be represented by 2 Colts The Statesman a 60,000 GNS Purchase & Edgar Allan Poe a 80,000 GNS Purchase. Pour Moi has one sole representative in the form of an unnamed colt out of Ysoldina a Half Brother to French Conditions winner Sweet Electra Canford Cliffs as of now has no representatives at Ballydoyle. Cape Cross has an interesting colt named Druids Cross who is a half Brother to Goodwood Stakes Winner Sands Of Fortune. Deep impact is represented by an unamed colt out of superstar mare Peeping Fawn. Dubawi is a fine Sire and Pushed Galileo all the way last season he has his first Juvenile at Ballydoyle an unamed Colt out of Montjeu mare Pink Symphony. Fastnet Rock has Plenty of Juveniles at Ballydoyle. Ambiguity a Full Brother to smart Ballydoyle 3YO Californiadreaming & Group 3 winner Cougar Mountain Assonance & an Unamed Colt out of Never Busy who was a 145,000 EUR Purchase. A colt out of Lady Lupus a full Brother to Shark Island & Lieutenant General. A 100,000 Gns purchase out of Arabian Mirage. & an unnamed Filly out of Dietrich and this juvenile is a Half Sister to Greatwallofchina Port of Spain Eskimo Order The Ferryman Agena & Aloft. Frankel has An Unamed colt out of Rosie's Posy who is a Half Brother to Multiple Group One Winners Make Believe & Dubawi Heights. Galileo as usual has a ton of ammunition at Ballydoyle as he should. To date only two has been named. Diodorus who is out of multiple group 1 winner Divine Proportions. & Yucatan who is out of multiple group 1 winner Six Perfections. 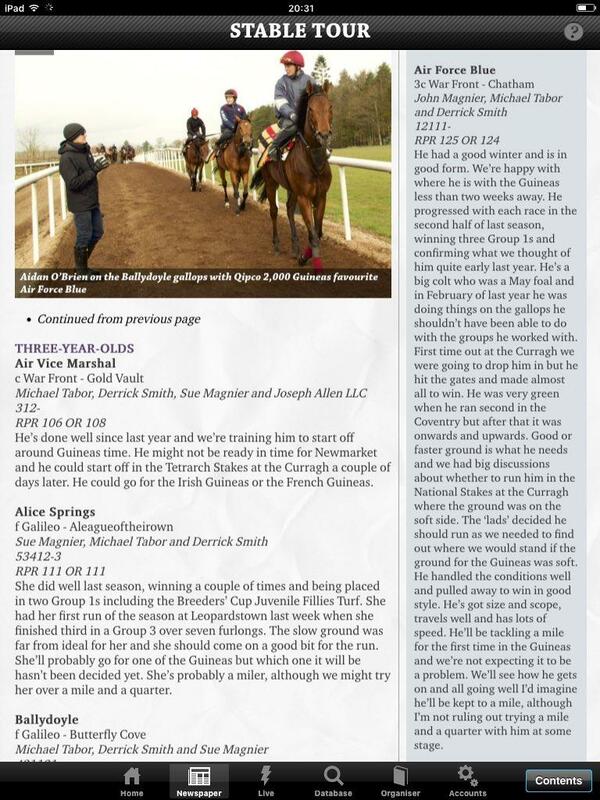 Galileo Colts of note are the Colt out of Alluring Park the dam of Oaks winner Was. Colt out of Anna Karenina the dam of Battle of Marengo. Colt out of Danedrop the dam of 5 time G1 winner Danedram. Colt out of Healing Music the dam of Workforce. Colt out of Love Me True the dam of Ruler of the World & Duke of Marmalade. Colt out of Miarixa the dam of dual classic winner Blue Bunting. Colt out of Mystical Lady the dam of Kingfisher. Colt out of Penang Pearl dam of Harbinger. Colt out of 4 time g1 winner Turbulent Descent. Colt out of Ventura the dam of Moonlight cloud. Colt out of You'resothrilling this 2YO is a full Brother to Marvellous Gleneagles & Coolmore. Galileo Fillies of note are Filly out of Mariah's Storm a Half Sister to Multiple G1 winner Giant's Causeway & You'resothrilling the Dam of Coolmore Gleneagles & Marvellous. Filly out of AZ Warrior. Filly out of Sumora dam of Group One winner Maybe & race winner Fluff & unraced Ballydoyle 3 year Old Celtic Chieftain. Filly out of La Traviata Dam of Cristoforo Colombo & Highly regarded Ballydoyle 3YO Seventh Heaven. Henrythenavigator has 1 colt & 1 Filly both owned by Annmarie. The Colt has been named Thomas O'Malley a half brother to Arya Tara. The filly has been named Hyzenthlay she is a Half Sister to Multiple Race Winners Asia Minor & Britannic. Holy Roman Emperor has a colt named Eagle Spirit a 70,000 Euro Purchase. Invincible Spirit has one colt named Pedestal a £220,000 Purchase. Lawman has one colt named Justice Frederick but could move to Joseph when he gets his licence. Rip Van Winkle Has a unamed colt out of Slink who was a 320,000 GNS Purchase and is a half Brother Ballydoyle Group 3 winner Bye Bye Birdie . The Factor one of War fronts best sons has his first Juvenile to be homed at Ballydoyle an unamed colt out of Seeking luck and was a $220,000 Purchase. War Front has some incredibly exciting Juveniles at Ballydoyle. So Far he has no named Colts. He has 2 Fillies who have just been named they are Roly Poly who is out of 4 time G1 winner 4 Group One misty For Me. Brave Anna the full sister to breeders Cup Juvenile Turf winner Hit it a Bomb. He has unamed colts out of Galileo Mare Kissed. Charming the dam of Take Charge Brandi. Good Vibes the dam of Sweet Orange who won over $10,685,820 in Career earnings. Sun Shower the dam of Excelebration. Magnificent Honour the sister to Rags to Riches. & unamed Fillies out of Wading Together & Imagine a whole lot to look forward to out of this crop. Gorgeous Galileo Filly who was a 550,000 GNS Purchase at Tatts 2014, She is a full Sister to Crocodile Rock, Kingston Jamaica & Group 2 placed Criteria. She Had 7 starts as a Juvenile winning 2 of those. She won the Tattersalls Millions Fillies trophy at Newmarket in October but undoubtedly her career highlight to date came at Breeders Cup 2015 where she put up a fantastic performance finishing runner up in the Fillies juvenile turf. She has already clocked up £328,476 in Career earnings. She holds entries in the English & Irish Guineas and the English & Irish Oaks. She has already proven she is a proper Group 1 Performer and there is more to come from her. Galileo Filly who is a full Sister to 4 time Group One Winner Misty For Me One of the greatest fillies ever homed at Ballydoyle she won 4 Group One races in her illustrious career. Ballydoyle clearly was always thought a lot of given the name bestowed upon her. Ballydoyle had 6 starts as a Juvenile and she won half of them the highlight being the 2015 Prix Marcel Boussac she was in a league of her own that day. Ballydoyle holds entries in the English & Irish Guineas and the English & Irish Oaks but Aidan suggests she will make a start in the French Guineas. I see her more as a miler than an Oaks Filly I think she will go to the French Guineas then the Irish version then the Coronation Stakes at Royal Ascot before taking on her elders in the Falmouth Stakes. She certainly has the potential to become a superstar in 2016. Highly regarded Galileo Filly who is a full sister to multiple Group One winner Found. She made 2 starts as a juvenile an eye catching run when finishing 2nd by half a length on debut at Gowran park in September. Broke her maiden on her final outing as a juvenile at the Curragh in mid October she was partnered by Ryan. She is very well thought of and I like her alot certainly one sneaking under the radar as of now. Watch this space a star could soon be born. Hold entries in all 4 Classics. Fastnet Rock filly who is a Full Sister to Cougar Mountain. She has changed ownership a few times from John Magnier to Annmarie O'Brien but will again now run in the Magnier navy blue colours pointing to her showing a vast improvement. She had 3 starts as a Juvenile she was one of the first 2 year olds out in 2015 starting her career in April at Navan she finished 3rd on the day and showed some potential. Was out again a month later and faired one better finishing 2nd in a Naas maiden. 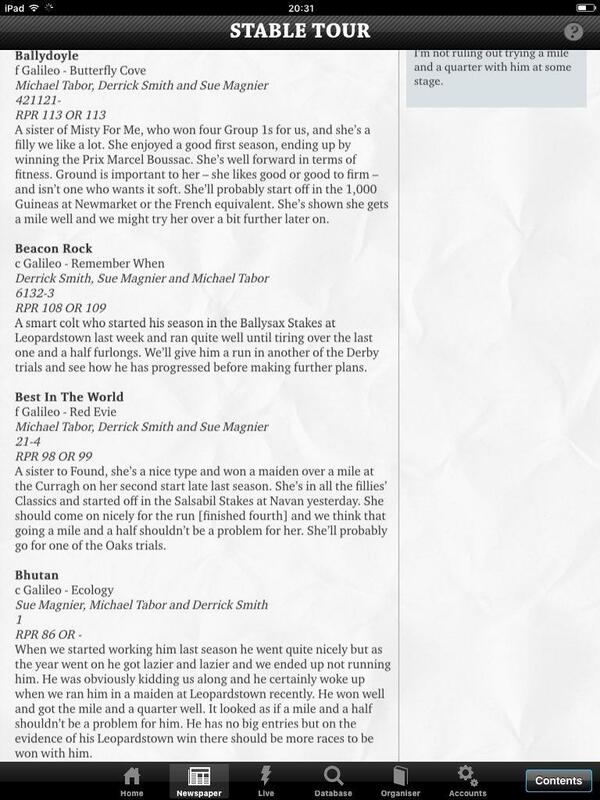 She was not seen again until late October and ran disappointingly finishing 7th of 8 runners in a Leopardstown maiden. So she comes into 2016 still a maiden but interesting holds entries in both the English & Irish Guineas. Certainly one to keep an eye on. Beautiful Galileo Filly who is a full Sister to G1 Winner Marvellous & multiple G1 winner Gleneagles and her 2 year old brother is also at Ballydoyle in 2016. Coolmore was given the name of a lifetime but was always a work in progress as a juvenile where she had 4 starts she actually broke her maiden tag in the Group 3 Weld Park Stakes quite an achievement. She went on to run a solid race finishing 4th in the Group One Fillies mile behind Minding which ended up being her last run. She has really grown over the winter i was really taken by the look of her at the Curragh over the weekend. Aidan has already stated that she will stay a good bit further than her siblings. I always saw her as an Oaks Filly. The best is certainly yet to come from her and come June should be a major contender in the Oaks. She could yet be anything and turn out to be the best of the fillies. She is still a little babyish but i'm sure Sunday would have done her alot of good. Fastnet Rock Filly who was a 400,000 GNS Purchase at Tatts 2014. She is a half Sister to Group 2 winner Ladys First. She got 4 starts as a Juvenile but remains a maiden she however did put in some solid performances and showed potential on her final run as a juvenile finishing 2nd of 10 in a Cork Maiden in mid October having said that she holds no entries in any of the classics and may be one of the lesser lights in this division. Unraced Dansili Filly who is the first offspring of Ballydoyle American Group One winner Together who won the 2011 Queen Elizabeth II Stakes at Keeneland. She is well thought of and holds entries in the Irish Guineas and Irish Oaks. Her pedigree leads me to believe she will be more of a miler. she is one to keep an eye on. Galileo Filly who is a half Sister to Group 1 winning sprinter Kingsgate Native. She had 2 starts as a Juvenile but is another who comes into 2016 still a maiden she showed some solid potential last time out finishing 5th in a Curragh Maiden in October. She holds no entries in any of the classics and maybe one of the lesser lights this term. Dansili Filly who is a full Sister to race winner Pour Deux. She had 2 solid runs as a Juvenile finishing 4th first time out in a Naas maiden in September and then going on to finish second in a Navan maiden in October 2 decent performances. 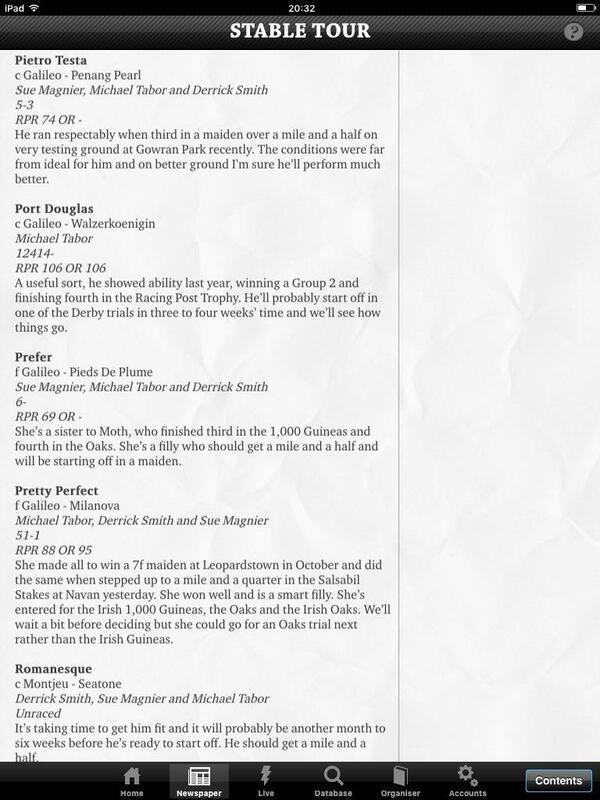 Holds entries in the Irish Guineas & Oaks. There is potential there and certainly alot more to come from her. Mastercraftsman filly who was a 170,000 EUR Purchase At Goffs 2014. She is a half Sister to Race Winners Lord Jim Simple Verse & Maxentius. She had 2 runs as a juvenile showed great potential finishing 3rd on debut in a Dundalk maiden. She broke her maiden tag next time out mighty impressively beating home a field of 13 by over 3 lengths at Leopardstown in October. She is certainly another nicely sneaking under the radar. She hold entries in all 4 classics in 2016 I like her alot one for the notebook. Unraced Galileo filly who was a 650,000 GNS Purchase at Tatts 2014. She is the First offspring of Jacqueline Quest who was disqualified after winning the 2010 1000 Guineas. Hibiscus only has 1 entry in the classics and that in the Irish Guineas. Look forward to her coming out and attempting to get rid of the maiden tag. She is a bit of a mystery horse to be honest. Fastnet Rock Filly who is a Full-sister to Group One winner Diamondsandrubies. She got her career off to a flyer winning first time out at the Curragh in August impressively. She then finished 2nd in a listed race again at the Curragh just finishing half a Length behind another Ballydoyle resident Kind Of Magic. Her final run of the season again came at the Curragh in the Weld Park Stakes finishing 6th behind Coolmore. She remains in all 4 classics and as we know with her sister the best came in her classic year she is certainly one not to write off. Galileo Filly who is the first offspring of Look At Me, who won the Listed Navigation Stakes at Cork in 2011. She had 4 starts as a juvenile she broke her maiden in the Flame of Tara Listed Stakes at the Curragh in late August it was her 3rd run. Her final run of the season came in the Weld Park Stakes G3 finishing 7th behind Coolmore. As a juvenile she looked a little exposed at the highest level. She holds entries in the Irish Guineas & Oaks she is a solid filly just not sure she is out of the top drawer I sincerely hope she proves me wrong. Unraced Galileo Filly who is is a full-sister to Battle Of Marengo, who won the Derrinstown Stud Derby Trial before finishing a close-up fourth at Epsom. Other relations include Perhaps, who pushed G1 winner Tapestry to a length and a quarter in the Debutante (Group 2) in 2013 and Loved. Sadly she holds no classic entries leading me to believe she will be one of the lesser lights. Unraced Fastnet Rock Filly. Luxury has a very bright pedigree and she is a half-sister to Shamardal and Geoffrey Chaucer but sadly has no classic entries maybe another lesser light in 2016. Superstar Galileo Filly. Her dam Lillie Langtry won two Group 1's as a three-year-old, winning the Coronation Stakes at Royal Ascot and then the Matron Stakes at Leopardstown. This is her second offspring, the first being smart maiden winner Kissed By Angels. Had a sensational juvenile career winning 2 group one races which inclued the Moyglare Stud Stakes and the brilliant winner of the Fillies Mile at Newmarket added to that she beat Group One winner BALLYDOYLE along the way her juvenile form is the best in the book. She always looked an Oaks filly to me but will make a start in the English Guineas she has wintered well and is a well respected contender in all of the classics this term odds on she adds to her group one CV in 2016. Galileo Filly who is a full-sister to Moth who was third in the 1000 Guineas at Newmarket and 4th in the Oaks the same season I was a big fan of Moth she was a great filly who never quite proved it on the track. only had one start as a juvenile in the Leopardstown maiden that Even Song won October Prefer finished 6th. She holds entries in the Irish Guineas & Oaks. Looks the type that may take time to come right but that will pay dividends later in the season. Galileo Filly who's pedigree might not not have you purring but she is a Galileo Danehill cross. She is a full sister to race winner Los Barbados. She smartly broke her duck in a Leopardstown maiden at the second attempt given a canny front running ride by Ana. She holds entries in the Irish Guineas & Oaks. To be honest i'm not completely sold on her but she has shown potential. Highly regarded Galileo filly who is a half-sister to Cristoforo Colombo. She was a real work in progress as a Juvenile. She showed little on debut finishing 7th in a Leopardstwon Maiden in September and was interestingly sent to Newmarket for her second attempt at breaking her maiden she was partnered by Paul Hannigan she did ok in 4th. she is entered in the Irish Guineas & Oaks. The best is yet to come with this filly the team think a lot of her but the classics may come too soon for her but one to keep an eye on. Fastnet Rock Filly with a pedigree to die for she is the 5th foal out of Epsom Oaks Heroine Alexandrova & she is a Half Sister to Alex My Boy Drops & Fonteyn. only 1 run as a Juvenile in the maiden that Pretty Perfect won she showed great potential finishing 3rd. She is another who is entered in the Irish Guineas & Oaks. I really liked the look of her on debut hopefully she will be out early to break her maiden tag then onto better things. Unraced Galileo Filly who's dam Beauty Bright has produced a few nice types in the past when mated with Galileo, but nothing really of the star quality, and her siblings include race winners Milky Way, Perfect Light, Greek Goddess and Highflying. 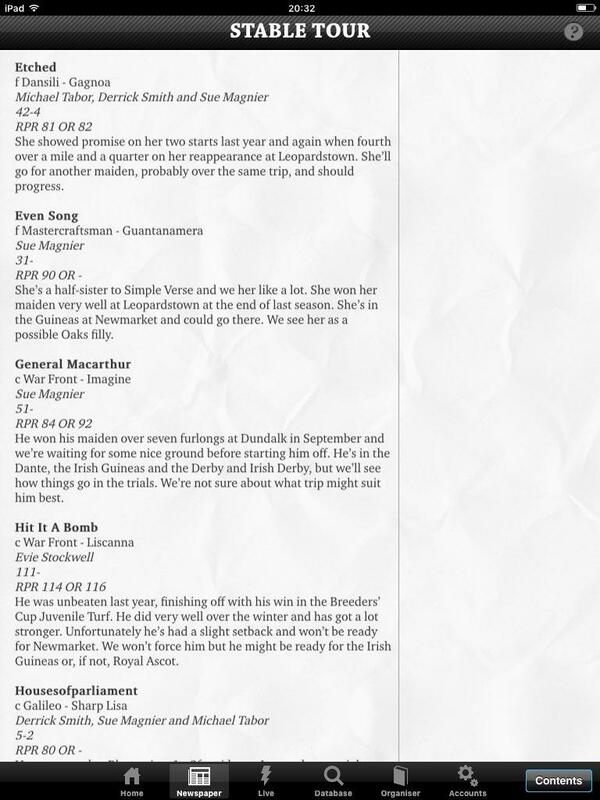 She holds no classic entries and is more than likely a lesser light. 5 individual Group one winners among the 3 year old division in 2016. The team boasts an incredibly strong hand in the mile division for colts lead by Air Force Blue and Hit It a Bomb. In The fillies Mile Division the team have a strong hand too with Ballydoyle & Minding who I believe will be suited by further. Last term was hugely disappointing when looking at the middle distance colts. This term while there are none really with outstanding claims as yet but im sure plenty of contenders will appear over the first few months of the season. Group One winner Johannes Vermeer looks one that has the scope to improve greatly from 2. There are a huge amount of regally breds unraced 3YO Colts and they could be anything. I'm particularly looking forward to seeing Sean O''Casey & US Army Ranger. 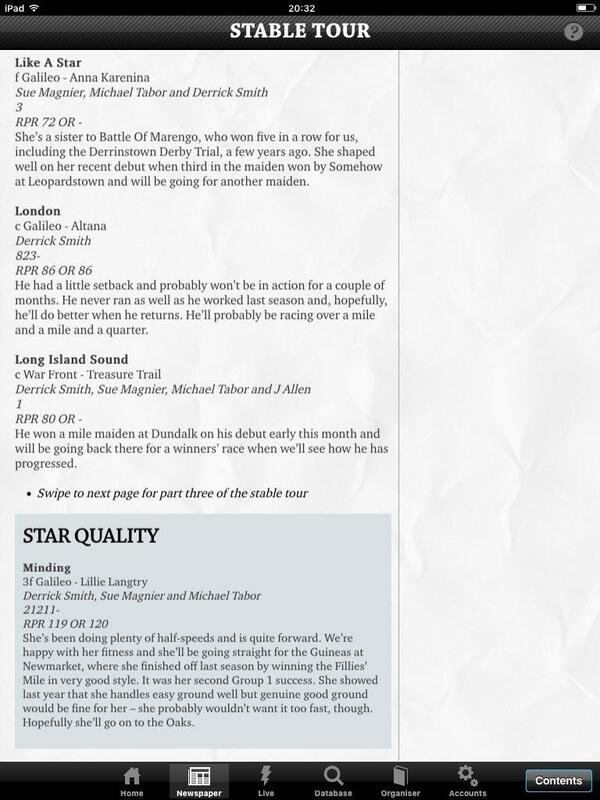 Plenty of Options too in the Fillies Middle distance ranks I really like Coolmore and Minding for the Oaks Best in the World too.There is plenty of ammunition among the 3YO Ranks should be a fine season and alot to look forward to. War Front 3YO who was a $2,200,000 Purchase at Keeneland 2014 and what a beast he looked on that day. Half-brother to Multiple Group One winner Contested, He's only had 3 runs to date Broke his maiden tag at the second attempt at Gowran park in June. He was then sent to England to run in the Group 2 Superlative Stakes in July at Goodwood Ran a decent race finishing second to Birchwood and was put away for the season afterwards. Was entered in the UAE Derby so id say he cant be far off a starting point this season. He's on my horses to follow 2015/16 list always thought alot of him and he seriously could be anything best certainly to come. Galileo Colt who is a Half Brother to multiple Group 3 winner Green Destiny. Had 2 starts as a juvenile and broke his maiden tag at the second attempt at Limerick in October. 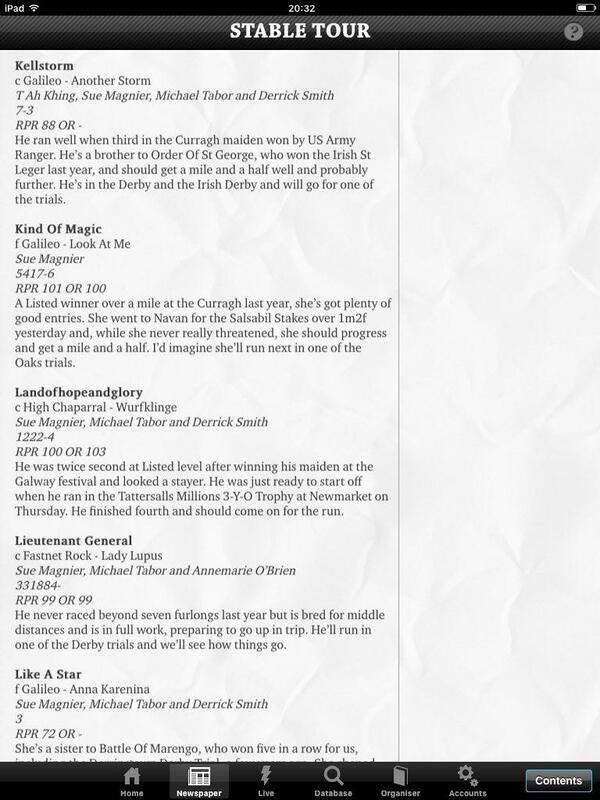 Has entries in the English and Irish Derby. 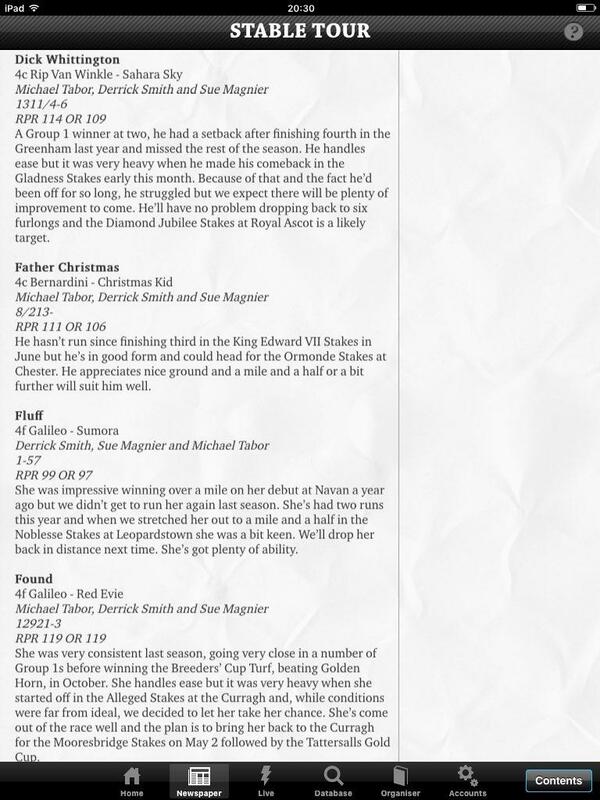 He's one who could be sent out early for a classic trial raced at 7 furlongs as a Juvenile could start at a mile or maybe go the Derby trial Route an interesting member of middle distance ranks. Galileo Colt Full Brother to Island in the Sun. Things did not go well for him as a Juvenile 2 starts and finished 7th of 12 and 9th of 16. He has no Major entries and was not present at the Curragh. Possibly one of the lesser lights this term. Galileo Colt Full Brother to Wedding Vow. His dam Remember When was second in 2010 Epsom Oaks this guy has an Epsom Pedigree. He had 4 starts as a Juvenile he always looked a work in progress. Broke his maiden at the second attempt at the Curragh in August. Then ran with great credit behind Port Douglas in the Beresford Stakes. Was then sent to England to contest the Group 3 Autumn Stakes he ran a cracker finishing 2nd beaten half a length by Gifted Master. He Has entries in the Epsom Derby & the Irish Guineas & Irish Derby More than Likely he will go to York or Chester for a trail and is one to watch. Galileo Colt A Full Brother to 2012 Dee Stakes winner & Epsom Derby 3rd Astrology. Another whom Things did not go well for as a Juvenile he had 3 starts and finished 6th of 14 5th of 12 8th of 12 he did show some potential. He has no Major entries and was not present at the Curragh. Possibly another who will be one of the lesser lights this term. Galileo Colt A Half Brother to Michaelmas & Father Christmas. He had 3 starts as a juvenile Broke his maiden at the second attempt at the the Curragh over 7 furlongs in October. He then ran in Killavulan Stakes Group 3 later that month and ran well finishing 3rd behind Blue De Vega. He always looked a work in progress as a 2 year old. He Has entries in the Epsom Derby & the Irish Guineas & Irish Derby Certainly one who should show plenty of improvement at 3. Highly Regarded Galileo Colt who was a 400,000 GNS Purchase at Tatts 2014. He is a Half Brother to Listed winner Palace who was 7th in last years Epsom Oaks. He has already made a start this season He ran on open day at the Curragh finishing 6th and on the face of it that looked a disappointing run he travelled well in the race but got tired at the end possibly down to being a bit ring rusty he was more than likely just out for a run. Some have already written him off as a Classic Prospect but I would not be so quick to do so & I think it would be foolish. He is very well thought of and I'd say he will be a very different horse come June. Needs to get out again in a few weeks and get rid of the maiden tag then onto better thing will also appreciate better ground still holds entries in all the right races. Galileo Colt who is a Full Brother to 3 time Group One winner Lush Lashes who's successes include the Coronation Stakes, Yorkshire Oaks & Matron Stakes in 2008. Another who has already made a start this season, He ran on open day at the Curragh and you would have to say he was very unlucky finished like a train once he got out in the clear and was a real eye catcher finishing 4th and went into many peoples notebooks afterwards. He holds entries in both the English & Irish Derby & it wont be long before he is back out to break his maiden tag. Fastnet Rock Colt who is a Half Brother race winners Wooden Heart, Falkland Flyer, Leaf, & Silky. He only had 2 starts as a Juvenile really impressively breaking his maiden at the second attempt at Navan in October scoring by just under 4 lengths he was then put away for the winter. Another who holds entries in both the English & Irish Derby and will no doubt be sent on the Derby trial route. Galileo Colt who is the first offspring of classy mare AZ Warrior who was a Grade One winner in USA, winning The 2010 Frizette Stakes. He also has a 2YO Full Sister at Ballydoyle. He had 3 starts as a juvenile and ran well in them all without breaking his maiden tag finishing 4th 2nd & 3rd. He also holds entries in both the English & Irish Derby but will need to get out fairly early and win his Maiden then off to better things afterwards. Galileo Colt who runs in the Fitri Hay Colours. He is a Full brother to multiple race winner The Corsican & his Dam was placed in graded company in USA. He got his career of to a Flyer winning his first 2 starts. He was then sent for 2 races in England the first being the Group 2 Royal Lodge Stakes he did well finishing 2nd just behind Foundation. He then represented Team Ballydoyle in the Group One racing Post Trophy where he ran a shade disappointingly behind Marcel and future Group One winner Johannes Vermeer. 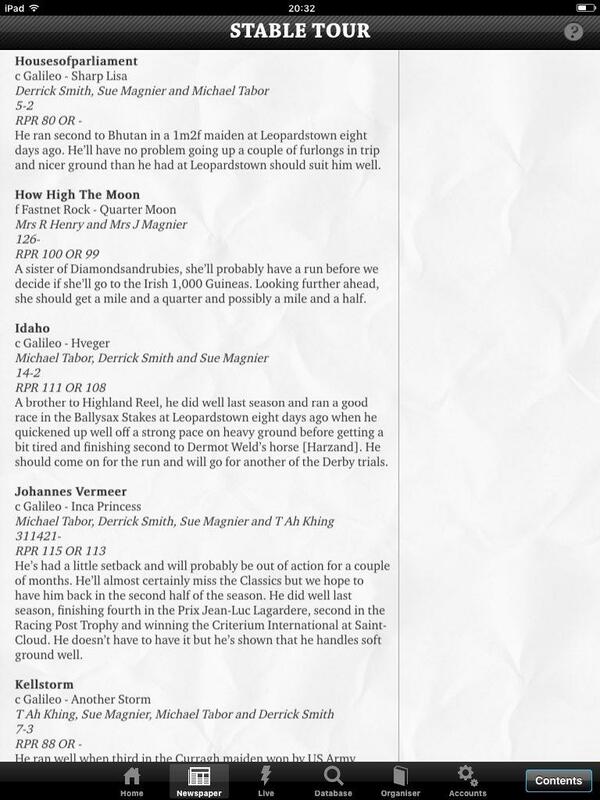 Holds entries in the Epsom Derby Irish Guineas & Derby I would just ignore his last run he could be a serious player in the classics this term. War Front Colt out of Imagine who was a brilliant Dual Classic winner. Half Brother to Group One winner Horatio Nelson & Group Two Winner Kitty Matchum. Had 2 cracks at breaking his maiden as a juvenile which he did at Dundalk last September leading home a field of 14 he was subsequently put away for the winter. He holds entries in the Epsom Derby Irish Guineas & Derby could he be the first War Front Epsom classic winner. To me he looks more of a miler and if thats the case were he will fit in as the team already have 2 serious miler prospects. He's on my horses to follow list so will be keeping a close eye on him. Brilliant Breeders Cup Juvenile winning War Front Colt out of Liscanna. He was the final 2YO to be named last year and was not named until late May. He has a 2YO Full sister at Ballydoyle and she has already been named Brave Anna a good sign that we will see her out early. Hit it a Bomb had 3 runs at 2 and won the lot Broke his maiden tag on debut then won at Dundalk before impressively winning at Breeders Cup 2015 where he showed an electric turn of foot and finishing burst to just get up on the line (I still have no idea how he won just the brilliance of Ryan Moore) He has grown nicely over the winter his muscles have muscles. It looks like he will start of in the French Guineas and he is a serious prospect I also think he will get a bit further than a mile in time could the Breeder Cup Classic be an end of season target for him. I have no doubts he will add to his sole Group One success this term an exciting horse maybe not quite in the league of AFB But who is. Galileo Colt Full brother to 2013 St Leger 5th Foundry. Only one run as a Juvenile which came at Tipperary over 9 furlongs in early October were he finished 5th Behind Siamsaiocht Cole Porter was also 3rd. He was then put away for the winter. He holds an entry at Cork on Saturday and also holds entries in the Epsom & Irish Derby, Like his Brother he could be more of a staying type and could be a Queens Vase horse Could follow a similar path to Leading Light to the St Leger he showed potential on debut one to watch. Galileo Colt Full Brother to Aloof & unraced 4YO Fairytale Ending who is with David Wachman. He only had one start as a 2YO he finished 7th of 16 at Navan last September. He holds no fancy entries and may be one of the lesser lights this term he did show some potential on Debut. Well thought of Galileo Colt who was a 750,000 GNS Purchase He is a Full brother to Multiple Group One winner Highland Reel. Got his career of to a mighty impressive start winning on debut by over 3 lengths at the Curragh in October. He was then sent straight into Group One Company in France when he ran in the Criterium De St Cloud the ground was pretty desperate and he just did not look quite ready for the step up in class and distance. He's entered in the Epsom Derby & Irish Derby and could be a big player come June. There's still plenty of improvement left in him. Well Regarded Galileo Colt Co-Owned by The China Horse Club. He was a 300,000 EUR Purchase at Goffs 2014 He is the First Foal of his dam Inca Princess who is a Holy Roman Emperor mare. He finished his Juvenile campaign as a Group One winner winning the Criterium International at St Cloud He also won the Champions Juvenile Stakes Group 3 on Irish Champions Weekend he has won 3 of his 6 starts to date. China horse club are keen for a Guineas runner which makes sense as he would have to carry a Group One penalty in any trial clearly he will be more suited by the Derby. He had plenty of room to grow and I think the best is yet to come from him in his classic year he is big player in the middle distance division in 2016. Galileo Colt Co-Owned by The China Horse Club whom they purchased for 875,000 GNS at Tatts 2014 He is full Brother to Irish St Leger winner Order Of St George. He only made one start as a Juvenile and finished down the field in 7th of 10 at Gowran Park in October he was picked by Joseph O'Brien on the day but stable mate Swordfighter fared better in the race. He is another who is Entered at Cork on Saturday and entered in the Epsom Derby & Irish Derby. In Time like his brother he may need further and could be a player in the St Leger. High Chaparral Colt who was a 260,000 GNS Purchase at Tatts 2014. He is a Half-brother to 3 time race winner Sir Fredlot. He had 4 starts a Juvenile and was never out of the top 2. He was Placed in the Listed Zetland Stakes at Newmarket in October over 10 furlongs. He looks an out and out stayer to me but Aidan Believes he will be a classic contender in 2016. Interestingly holds an entry in the Irish 2000 Guineas a trip I personally think would be 2 short for him also holds an entry in both Derbies. I see him as more of a Leger type. Galileo Colt who was a 300,000 GNS Purchase at Tatts 2014. He is a full Brother to 2006 Blue Wind Stakes G3 Winner Galatee. He is still a maiden after 3 starts as a Juvenile but was never far away, 2 of those maiden races were won by Shogun and Herald the Dawn so he has solid form lines. He holds an entry in Both the Epsom & Irish Derby. Another one who will be out early enough to try and break his maiden tag. Out of the first crop of Canford Cliffs. Half Brother to Race winners Keeneland & Welsh Bard. He's already a Group 2 winner he won the 2015 Railway Stakes spent the most of the rest of his Juvenile Career chasing home Air Force Blue. He holds an entry in both the English & Irish 2000 Guineas he is a nice horse but think Ballydoyle have bigger guns in the mile division this term. Held on the form of Air Force Blue but that shouldn't count against him..
Galileo Colt who was a whopping 2,600,000 GNS Purchase at Tatts 2014. He is a Half Brother to King George winner Harbinger. He received a name change during last season he was previously named Londonderry Air. Only made one start as a Juvenile and that came at Leopardstown in October he ran well in 5th place behind Bravery who finished 2nd on the day. He showed potential. He is fairly high up the Epsom Derby market currently priced at 25/1 which is short enough for a maiden. He holds entries in all the right races and really could be anything he is another on my horses to follow list and I have high hopes for him. Galileo Colt His Dam was a multiple Group race winner in Italy & France, she was also Group One placed. Half Brother to multiple Group One winner In Germany Wiener Walzer. Given a Canny ride by Emmet McNamara in the 2015 Beresford Stakes Group 2 a Race which he won from the front he was then sent to Doncaster to run in the Racing Post Trophy and was deservedly again partnered by Emmet he ran ok in 4th this was his final run as a juvenile. He holds entries in the Irish Guineas & Both the Epsom & Irish Derby. As a juvenile he looked like a staying type. War Front Colt who was a $1,300,000 Purchase at Keenland 2014. He is a Half brother to graded stakes placed Timely Tally. He had 3 starts as a Juvenile he ran well on all 3 occasions but remains a maiden. He is another who is entered at Cork this weekend and holds an entry in the Irish 2000 Guineas. He looked a work in progress at 2 better to come from him. Well Regarded Fastnet Rock Colt who cost 400,000 EUR at Goffs 2014 and is Co Owned By Annmarie O'Brien. He is a full Brother to Epsom Oaks Heroine Qualify. It was a bit of a mixed bag to his juvenile career. He is ground dependent and wants proper fast summer ground. Did not show himself at his best last time out when finishing 10th behind Hit it a Bomb at the Breeders Cup. He is very well thought of and it would be foolish to write him off. One of the few Ballydoyle colts to hold entries in the English & Irish Guineas and English & Irish Derby. Galileo Colt His Dams sixth foal and so far has failed to produce anything of note. Had 2 runs as a Juvenile but did not fair too well. Another entered at Cork at the weekend but holds no other entries could be a lesser light this season. Galileo Colt Half brother to race winners Spiritual Healing & Big Audi. Was previously named Monarch. Only had one start as a Juvenile and was an eye catching 3rd at Gowran Park in late October. Another entered at Cork at the weekend and holds entries in the Epsom & Irish Derby. He was removed from the tattersalls Horses in taining sale last October and I dont blame them he showed serious potential on debut one to watch. Galileo Colt who was a Purchase 1,500,000 EUR at Goffs 2014. Full brother to Albany Stakes (Group 3 winners Cuis Ghaire & Scintillula. Only had one start as a juvenile at Leopardstown in October were he finished in midfield. Clearly he is well thought of was kept in the Derby at the latest forfiet stage and is also in the Irish Guineas & Derby. Out of the first crop of champion 2015 First Season Sire Zoffany who was a 340,000 EUR Purchase at Goffs 2014. Was a high class juvenile won the Windsor Castle Stakes (Listed) at Royal Ascot and ran well in 2nd behind Air Force Blue in the Group One Pheonix Stakes It ended up being his last run as a Juvenile he was entered at the Breeders Cup But did not take his place. 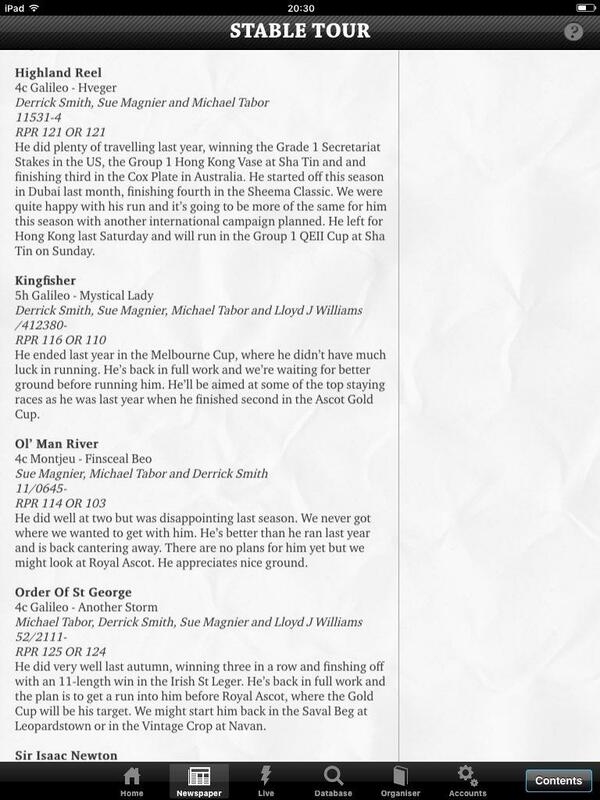 Holds entries in the English & Irish Guineas. His form is solid and could have a big season ahead. Out of the first crop of champion 2015 First Season Sire Zoffany. who was a 350,000 GNS Purchase at Tatts 2014. Forces of Darkness a Group 3 winner in France. (Received a Name Change during the spring was previously named General Belgrano) Took a while to get going as juvenile took 4 starts to break his maiden and then went on to Royal Ascot 2015 and won the Group 2 Norfolk Stakes.t Later ran well in 2nd at Newmarket in the Tattersalls millions Trophy. He was not at his best when last seen running on the dirt in the Breeders Cup Juvenile his last run to date. Holds entries in the English & Irish Guineas another nice option in the mile division. This took longer than thought so will split them 3YO raced colts on Thursday and hopefully All 3YO Fillies on Friday Then the Juveniles on Saturday. Many thanks to my proof reader Red. Galileo Colt who Cost 750,000 GNS He is the final foal out of Flirtation His Half sister Attraction was a Multiple G1 winner Big Ben was a gorgeous yearling he really took the eye. Not seen out at 2 but is entered in The Derby. He was present at the Curragh. A good sign that he will soon be seen out. Galileo Colt who is a Half Brother to American multiple Grade One winner General Quarters. 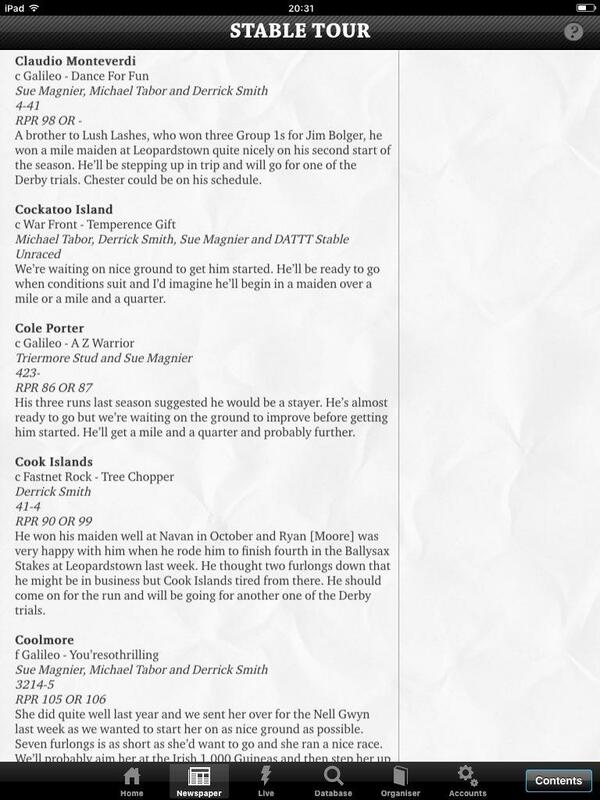 He has no entries to his name but was present at the Curragh. he could be a wait and see horse..
A War Front Colt Half Brother to Borderland Derby winner Fusa Code. unusual to see an unraced War Front 2 Year old they are usually so precocious. Entered in the Derby & Irish Guineas also Entered on Cork on Saturday. Fastnet Rock Colt Half Brother to Mutliple Group One winner Rumpelstiltskin (The Dam of Tapestry) He has no entries to his name & wasn't present at the Curragh. One we may not see anytime soon. Galileo Colt A Full brother to Multiple Group One winner Maybe. Recently taken out of the Derby but remains in the Irish Derby He was also not present on Sunday and could be another taking longer to come to hand. Another unraced War Front Colt Half Brother to Lady Tapit & 6 time race winner Gallileo Figaro. 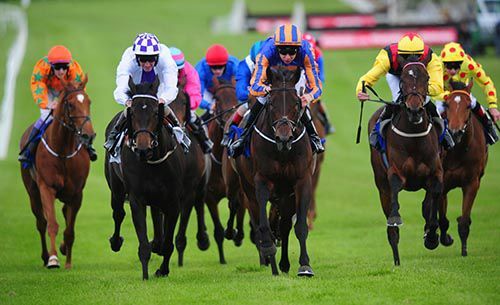 Has Entries in the Irish Guineas & Irish Derby a good sign but was not present at the Curragh. Galileo Colt who is a Full Brother to Hobart & Thomas Wedgwood. He has been Kept in the Epsom Derby at the latest Forfeit stage & Irish Guineas & Irish Derby which is a very good sign. Not present at the Curragh. Street Cry Colt A New Recruit from America No Less than ZENYATTA's Full Brother Heard he has plenty of Stamina and may not be seen until later in the season Also Has No Entries. Galileo Colt who is a Half Brother to 2006 Middle Park Stakes winner Dutch Art. 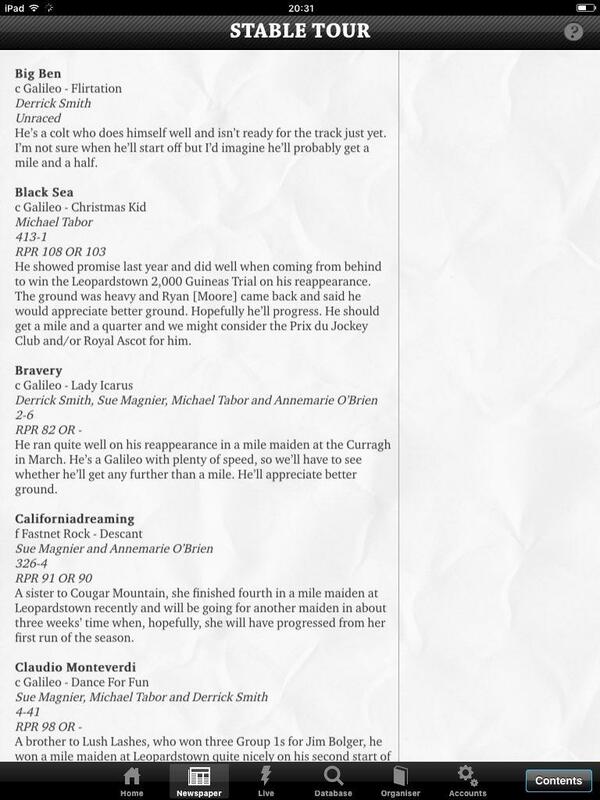 Has No Entires and was not present at the Curragh on Sunday. Possibly another taking longer to come to hand. A Rare Ballydoyle Oasis Dream Colt A Full Brother to Group Two placed Toogoodtobetrue. Another who has no entries to his Name & not Present at the Curragh & Could be another Backwards type strange given his Pedigree. Yet another Unraced War Front Colt who was a $800,000 Purchase. His Dam is a half sister of Superstar Mare Zenyatta. Another who has no entries and was not present on Sunday. Galileo Colt Full brother to multiple Group One winner Roderic O'Connor & Listed winner Dazzling was given a very Special Name Early on Last Year FINN MCCOOL But was renamed and then renamed again after that. He worked at the Curragh and has entries in the Epsom Derby & the Irish Guineas & Irish Derby Suspect wont be long before we get to see him. Galileo Colt Full Brother to race winner Robin Hood another with no entries and not present on Sunday. One of the final Montjeu's This colt was the Dams first foal she was a race winner in France. Interestingly kept in the Epsom Derby and I Pray that Montjeu finds a Star from his final crop. He was not working on Sunday. Galileo Colt His Dam Rumpelstiltskin was a dual Group One winner in Ireland & France as a two-year-old full brother of Yorkshire Oaks winner Tapestry & John F Kennedy. Even though he was not seen out as a Juvenile he has Entries in all the Right Places entered in Epsom Derby & the Irish Guineas & Irish Derby. He was present at the Curragh. He could be anything but going by his siblings will need a few races to get going. Fastnet Rock Colt who was a 320,000 GNS purchase. He's a Half Brother to 2013 Epsom Oaks Winner Talent. 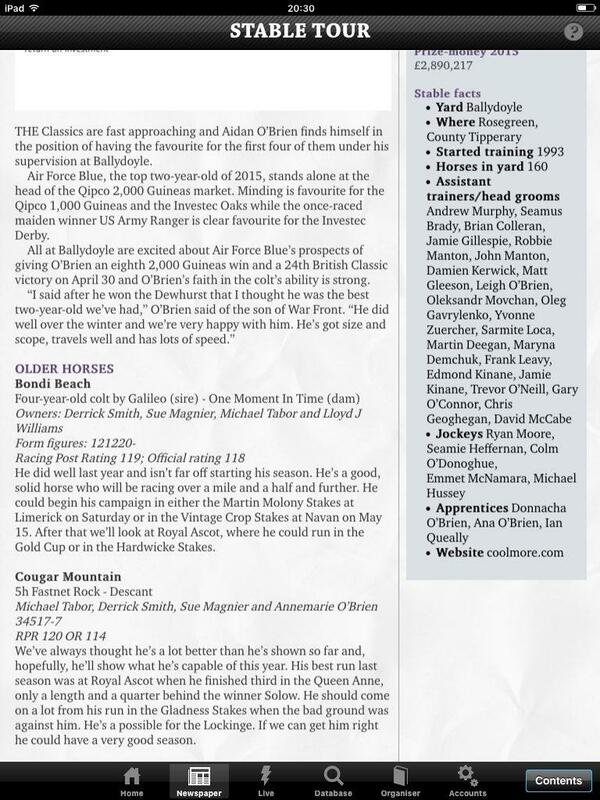 Another Colt with no Major entries and was not present at The Curragh. Pour Moi Colt who was a 210,000 GNS Purchase. This is the Dams first foal she was a Group Three winner. He's another who has Entries in all the Right Places entered in the Epsom Derby & the Irish Guineas & Irish Derby. Highly Regarded Galileo Colt who has been given a very special name and one that has been kept for years. Half Brother to Group 3 winner Liscanna who is the Dam of 2015 breeders Cup Juvenile Winner Hit it a Bomb. Entered at Cork on Saturday and entered in the Epsom Derby & the Irish Guineas & Irish Derby. One for the notebook lads. Fastnet Rock Colt who has a pedigree to die for and is a Half-Brother to high class fillies Bracelet & Wading His Dam is a half sister to Sea The Stars & Galileo. Second Dam is Urban Sea. Has no major entries which is disappointing given that Pedigree also not present at the Curragh but one who could be worth waiting for. Galileo Colt A Full Brother to Classy filly Queen Nefertiti & unbeaten colt Illinois who sadly is no longer with us. Had Serious Colic Surgery last year anything he achieves this year will be a bonus we are just glad he is still with us was great to see him at in action at the Curragh & Does Hold Entries in the Epsom Derby & the Irish Guineas & Irish Derby. Montjeu Colt who was a 675,000 GNS Purchase. His Dam ran twice, winning once over 1m in France Three Star General is a Brother to Vahorimix, top class miler Volisix, He's still in the Epsom Derby and worked at the Curragh on Sunday. Another I Hope will do well for his Father. Oasis Dream Dream colt Out of Wonder of Wonders this is her first foal. She was second in 2011 Epsom Oaks & 3rd in 2011 Irish Oaks. Also 3rd in the 2011 Yorkshire Oaks. He remains entered in the Irish Derby. He did not Work at the Curragh. Galileo Colt who was Previously named Hyde Park. he's a Half Brother to Multiple Group race winner Caribbean Sunset. he is another who is entered up at Cork On Saturday so obviously one who is ready to roll in 2016. Also entered in the 2016 Epsom Derby. Galileo Colt. this is the Dams 2nd foal, The first is yet to reach the track. Dam was placed in pattern company. Triplicate remains in the Irish Derby. 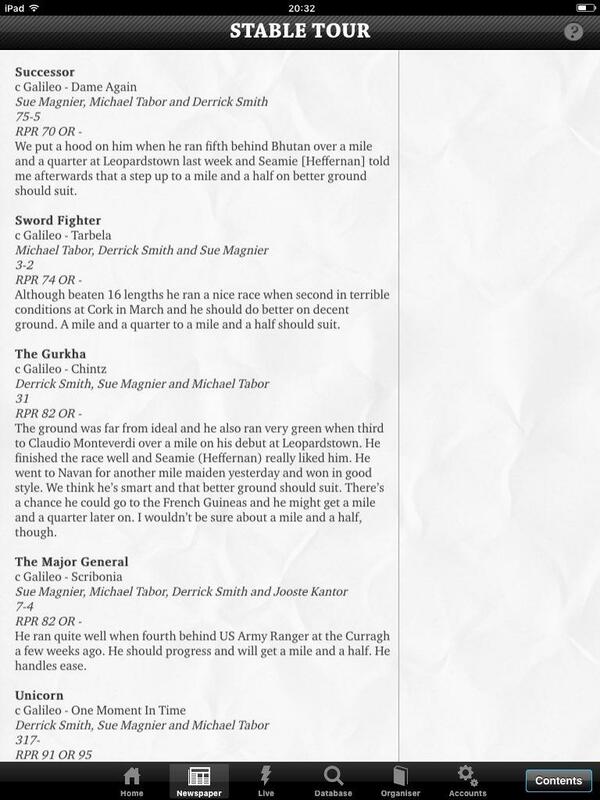 was not present at the Curragh. Going by his Sibling he may be a little backward. Highly Regarded Galileo Colt who's Pedigree screams Derby. He is a Half Brother to Classy Filly Words, Lingfield Derby Trial winner Nevis & Listed Winner Stubbs. His Dam Moonstone was the Irish oaks winner in 2008. He was at the Curragh on Sunday and is entered in the Epsom Derby & the Irish Guineas & Irish Derby. Vibes are good for this fella another for the notebook. High Chaparral Colt who was a 180,000 GNS Purchase this is the Dams First foal. 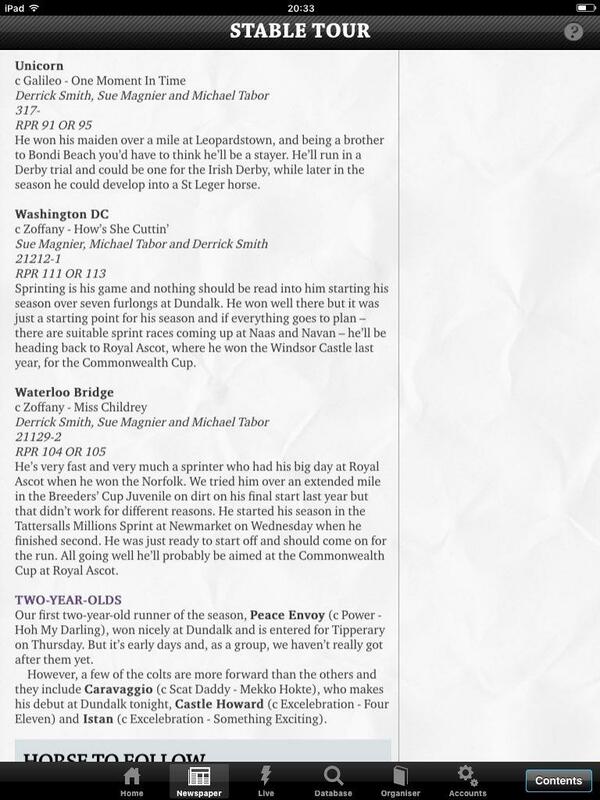 He has no entries to his name and was not at the Curragh Maybe taking a while to come to hand. New Recruit from the Gai Waterhouse yard in Australia a son of Medaglia d´Oro already a Group one Winner winning the 2015 Golden Slipper. possibly shipped over to contest sprints but I suspect he could be more of a Miler. Was not present at the after racing workout on Sunday likely to need more time and the Lockinge in May could come too soon but bound to be in great shape by Royal Ascot and the Queen Anne could be his Target he could be anything. The 4YO son of Galileo was the 2015 St Leger runner up a race which he won in the stewards room and then lost in the Appeal Hearing. Last seen running in the Melbourne Cup in November finishing 16th. Has clearly been kept to Bolster a strong staying division this term. Not quite in the same league as stable mate Order of St George but will be a big Player in staying races this term Target could be the Ascot Gold Cup. The 5yo son of Fastnet Rock has looked slightly exposed at the very highest level started out as a sprinter then was tried over a mile where he ran well finishing 3rd behind Solow in the 2015 Queen Anne so far his career highlight. Has since been tried twice at 1 mile 2 furlongs a trip he clearly does not stay. Can see him going back to a mile this term and could run in the Lockinge I would be somewhat surprised if he bagged a Group One this season but has been kept for a reason. Was Intrigued that the 4YO son of Rip Van Winkle was kept in training he was lightly raced at 3 only appeared once in the Greenham Stakes (Guineas Trial) in April 2015 he finished 4th & has been off the track since. He's Already a Group One winner Winning the 2014 Phoenix Stakes I think its a good sign that he has been kept pointing to the best is yet to come and he could come alive as a 4 year old. I'd say he will be running in Sprints & Mile Races this term could also start in the Lockinge. Lightly raced 4YO Son of Bernardini who is a Half Brother to Black Sea & Michaelmas. So far he has won 1 from 4 starts broke his maiden at Rosscommon last June and just 2 weeks later ran a stormer in the King Edward Stakes Group 2 finishing 3rd ahead of Stable Mate Ol'Man River Really interesting that this fella has been kept he still could be anything. Has an entry in the Tatts Gold Cup but see him as back up to Highland Reel and Found for the mile 4 races like the Coronation Cup. He's not usually the type they keep so there must be something about him suspect he could be a very smart 4YO. Lightly Raced 4YO son of Montjeu broke his Maiden at the first attempt at Leopardstown in August 2015 then disappointed finishing 4th of 4 in the Ladbrokes Stakes Race. 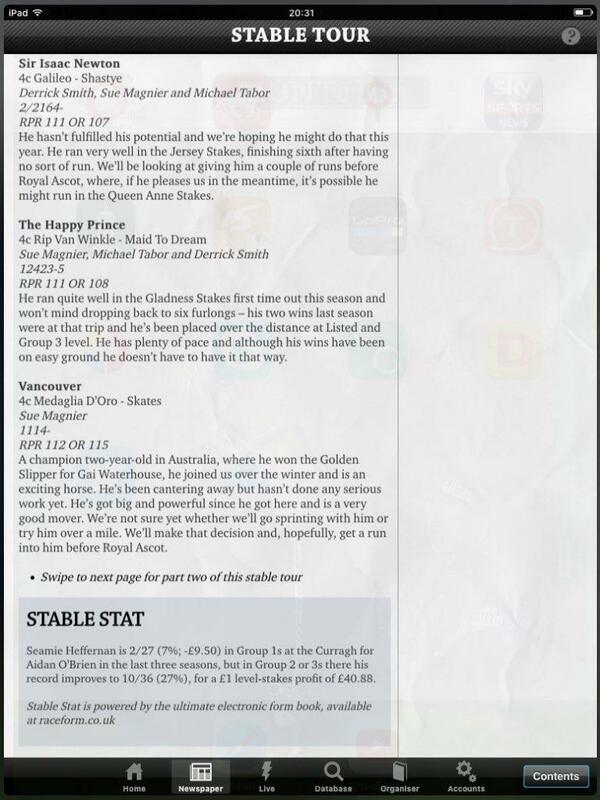 Another type they rarely keep so keep an eye on him may contest Handicaps early on. Multiple Group One winning 4YO son of Galileo Winner of the 2015 Secretariat Stakes & Hong Kong Vase. Starts of at Meydan on Saturday runs in the Sheema Classic will be partnered by Ryan Moore and has a great chance. His Form is strong even when he did not win races as a 3 year old he always performed well Make Believe New Bay Jack Hobbs Golden Horn & Winx all beat him in races last year that is a top class cast and his form is top class even though In Many peoples eyes he is not a Superstar I personally think he could be in for a Big season could continue to globe trot too with Found being the Number one in the middle distance races he could be sent on his travels but adds great depth to the older division. 5yo son of Galileo who ran an incredible race in the 2015 Ascot Gold Cup and was so so unlucky finishing strongly in 2nd spot Ryan is still gutted about that. He is yet to win a Group race in his career something i'm sure he will put right during 2016. He is not quite in the same class of Order of St George but will no doubt be again targeted at the Gold Cup he adds good depth to incredably strong Staying Division of Older horses.